If your name happens to be Gary Larson, I hate to disappoint you with the title of this post, but I am referring to the cartoonist. I love The Far Side. The cartoons have always spoken to me. It's hard not to love cartoons featuring animals, aliens, nerds, heaven, hell, castaways, and insects. I have often felt like a kindred spirit to the creator of the series. 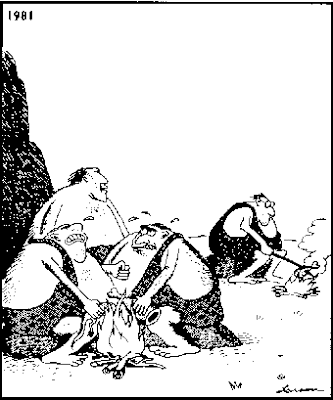 It has been nearly 15 years since Gary Larson retired and I miss seeing new stuff. I'd love to see him come out of retirement. I hate to see good things go away. One artist that has kind of reminds me of him is John McPherson of Close to Home because he has some random and odd cartoons, but his are very hit and miss. Larson was a hit every time and I doubt anyone will ever replace him. "Hey look what Zog Do!" I loved The Far Side. My favorite was the one where the kid is trying to enter The Gifted School and is pushing on a door marked PULL. BWAHAHA! Such original stuff he had, and classic! My dad LOVED the Far Side. We would get him a calendar every year! I agree. I totally miss his random, absurd, and hilarious cartoons! I hate to admit to this, but there are times when I totally did not get the cartoon. I loved all of his stuff though. I need to dig up my Far Side book and find those mysterious cartoons.